Thera-Pearl Eye Mask offers a therapeutic spa-like treatment for a variety of eye conditions, from the comfort of your own home. Developed by eye care professional Bausch & Lomb, the eye-ssential mask is perfect for treating dry eye, blepharitis, sinus headaches, irritation and relieve puffy eyes. 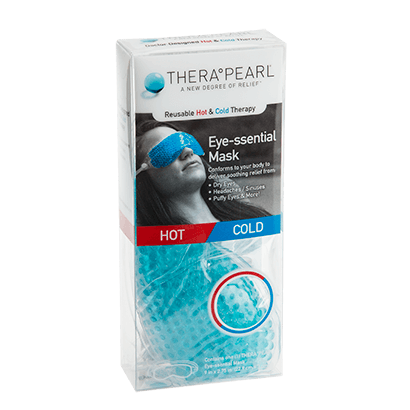 Suitable cold or hot, you can choose the type of treatment you’re after with Thera-Pearl Eye Mask. Designed with Pearl Technology, the small pearls can retain heat or remain cool for long periods of time. This versatile product is suited to those with even the most sensitive eyes. For use, simply chill in the freezer for 2 hours to rejuvenate tired eyes or minimise the sting of a brow wax. Alternatively, Thera-Pearl Eye Mask can be used as a hot compress. Pop into the microwave for 15 seconds to relieve dry eyes, or to simply clear your nasal passages and airways. For all other eye care products, browse our range at FeelGoodContacts.com. For any questions you may have, don’t hesitate to contact our helpful customer service team. Perfect. Thanks for the haribo!!! Excellent service. Very fast, tracked, delivery. Perfect product, well packed. Thanks for the sweets! Fantastic product. Use it hot just before bed. Very soothing, especially after a long day looking at a computer screen. My optician recommended this eye mask. It is exactly what I expected it to be.